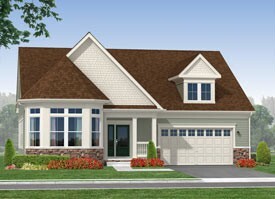 THE LOREN - Starting from $349,900 3 - 5 Bedrooms / 2 - 4 Bathrooms / 2,097 - 4,070 sq. ft. A winning combination of classic and contemporary, the Loren features a flexible, open floor plan. The long hall foyer leads to abundant flexible living and dining space perfect for entertaining. The island kitchen and breakfast area with a wall of windows allows for abundant light. The spacious owner’s suite comes complete with two large walk-in closets and luxury bath, and is just a convenient few steps from the laundry room. Two inviting secondary bedrooms and a bath are on the opposite side of the home; the option to add a second floor provides opportunity to expand living space even further. Square footage from 2,097 to 4,070. Starting from $349,900.